Roasted root vegetables, a winter favorite, are turned from side dish to simple main course here. For extra pop, I added some grape tomatoes in the last fifteen minutes of cooking which transformed them from mere juicy balloons into delicate, concentrated little grenades of warm juice that like to explode in your mouth (just remember to let them cool a couple minutes before eating). It’s difficult to get each type of vegetable cooked to about the same degree of doneness in a dish like this, but it’s nice to enjoy their differing textures — the bitterest ones like turnips benefitted from a longer cook and tasted really mellow while their texture held up. Some of the yams in this one turned into a carmelized mush that was not the least bit unpleasant. To add a little green, it would not be outrageous to throw in some green beans in the last fifteen minutes of cooking, or begin the process with some halved brussel sprouts as well. As for the sausage, I enjoyed the fennel spices in sweet Italian sausage for this, but I’m sure that anyone’s favorite sausage would pair well: chicken apple, merguez, boudin blanc, etc. — or of course, one of those great faux sausages for vegetarians. Preheat oven to 350 degrees. Cut vegetables down to about 1-2 inch pieces of equal size. Separate the harder vegetables (turnips, beets, yams, squash) from the softer ones (potatoes, carrots). Coat harder vegetables and garlic cloves in a little olive oil and bake in a casserole covered with tin foil or a lid for about 20 minutes. Remove from oven and uncover. Add potatoes and other vegetables, along with an even sprinkle of salt, pepper, rosemary and another drizzle of olive oil, and bake again for about 30 minutes. Meanwhile, brown sausages on all sides in a pan or grill. Blot excess grease with paper towels and slice into 1-inch pieces. 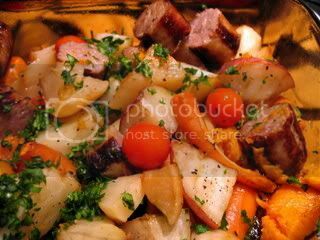 Remove casserole from oven and arrange sausages and grape tomatoes, if using, in the dish and return to the oven for another 10-15 minutes. Toss vegetables with parsley and serve. Six brownie points: those vegetables look really pretty and glossy because they’re coated with sausage-y grease, which I’ve got to say, is a heck of a lot tastier than olive oil. But a good assortment of vegetables lends to a wide spread of vitamins that are so much needed for those early spring sniffles. Roasted vegetables have become a favorite of mine, but I have to have an onion thrown in, too. Yours looks delicious and the addition of sausage does make the meal complete. I will try this addition next time. I just made this for my boyfriend and he absolutely loved it. It was delicious! The grape tomatoes are a great touch. We used Andouille and Italian chicken sausages. 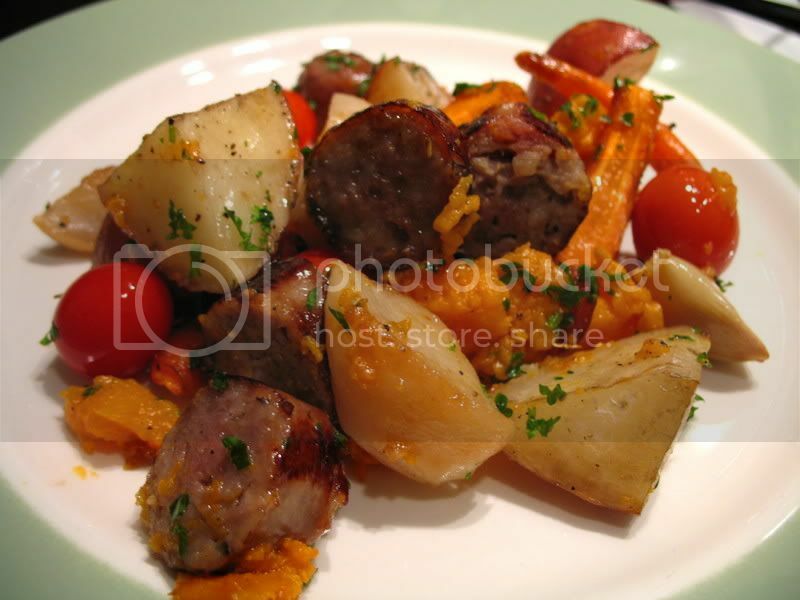 The spicyness of the sausage was complimented by the sweet yams and roasted garic. Yum! Thanks, I can’t wait to try more of your recipes. May I suggest you add to the dish, 15 minutes before serving, a few finely slices GREEN olives? I tried it last night and it was delicious! Great website, great recipes — happy to have found you! May I suggest you add to the dish, 15 minutes before serving, a few finely sliced GREEN olives? I tried it last night and it was delicious! Great website, great recipes — happy to have found you! Not that I’m totally impressed, but this is more than I expected for when I found a link on Delicious telling that the info is awesome. Thanks.